Today is National Sisters Day and to celebrate we have been trying out the Baby Born Sister doll. She's an interactive doll which thankfully doesn't require batteries. You can still feed her juice and also make her cry (by squeezing her arm). My daughter thinks it's hilarious that she can cry real tears and keeps making her spurt tears all over me when we play! It's been interesting to see my daughter play so well with the doll as recently she has sworn blind that she only likes "boylish", whatever that is! She does love imaginary play though and it's great to see her really losing herself in games. My daughter would love to be a big sister and, seeing as it's not going to happen, she's enjoying mothering the Baby Born® Interactive Sister. The doll has long hair which can be brushed and styled. She comes with a brush, three hair clips and two scrunchies. 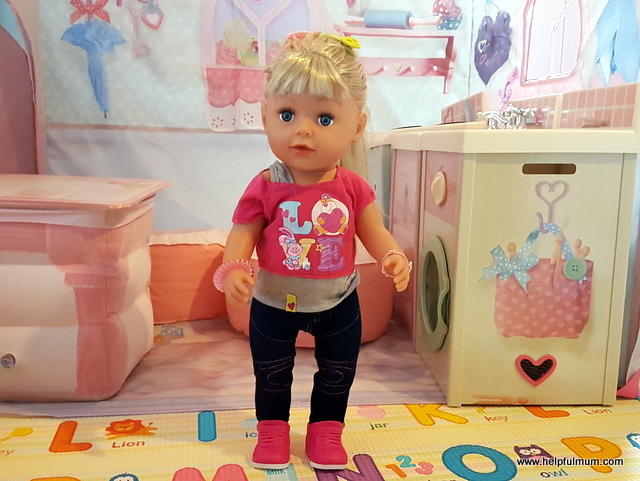 The Baby Born sister doll is able to stand, and has flexible joints which makes her far easier to move into different positions. My daughter has really enjoyed playing with her and I think the flexibility of the doll definitely helps as she often gets frustrated with other dolls she owns because they are difficult to move into prams and cots. The doll comes with a shirt, a pair of leggings, a pair of show, a bottle and one friendship bracelet for the child and one for the doll. The clothes also fit all Baby Born babies, so you can use the clothes on other dolls. It took us a while to realise that the friendship bracelet was for my daughter, but once we worked it out, she has worn it often, making sure it's on the same arm as the sister doll. She has also really taken to brushing the dolls hair and putting clips in it. Her only frustration is that the doll's eyes don't close when you lie her down. The Baby Born Sister retails at £44.99 and will be available in shops by the 16th of August. This would make a great toy for a soon-to-be big sister, or a child who would love to be an older sister. My daughter has really enjoyed playing with it so far. I love the fact that it doesn't make any noise! Disclosure: We received a Baby Born Sister Doll for the purpose of review. This had no impact on my post, which is honest and fair.